Robin Bush died from leukemia at age 3 in 1953. Former president George H.W. Bush died Friday, reuniting with his wife of 73 years, Barbara, and 3-year-old daughter, Robin. The 41st president will be laid to rest beside Barbara and Robin in their family plot at the George H.W. Bush Presidential Library in Texas on Thursday. The three are depicted in a viral cartoon by Clarion Ledger cartoonist Marshall Ramsey. 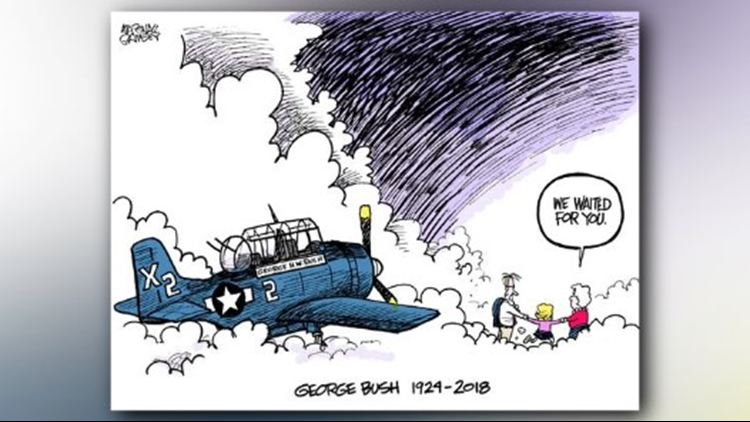 It shows shows Bush flying his TBM Avenger, the same plane he flew in the Navy during World War II, up into the clouds to join his wife who passed away in April and their young daughter, Robin. 1. 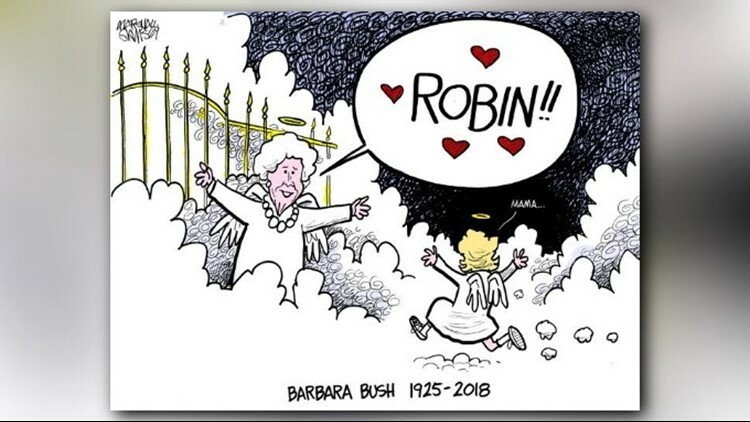 How did Robin Bush die? Robin Bush died from leukemia at age 3 in 1953. She was diagnosed seven months before her death. Pauline Robinson “Robin” Bush was born in 1949. She was the couple's second child. George Walker Bush was born in 1946. Ramsey's latest cartoon is a follow-up to his viral cartoon depicting Barbara reuniting with her daughter after decades apart. "I received a very kind note from President George H.W. Bush's Chief of Staff for the Barbara Bush cartoon. President Bush was unable to write due to his Parkinson's, but it was his sentiments. And it was very humble and gracious," Ramsey said. When thinking about how to commemorate George H.W. Bush, Ramsey thought of a striking scene from Barbara's memorial service. Barbara Bush will be buried near her daughter Robin, who died at three from Leukemia. They will be together. Kirk A. Bado of USA TODAY contributed to this report.